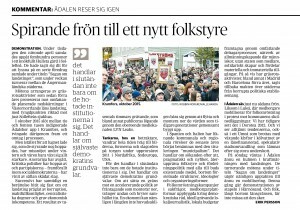 On the 31st of January 2012, the residents of the village Dorotea in the northern Sweden occupied their public health center to protest against the withdrawal of emergency care places. Three years of occupation, a municipal change of power and the first indicative referendum in a whole regional council later, the county council eventually gives up. The care sites were restored. One hundred and fifty kilometres south. Another county. Another austerity package, nevertheless directed against the economic peripheries of the county. Almost to the day, five years after the occupation began in Dorotea, January 30th 2017, hundreds of Ådalens inhabitants poured into the foyer at Sollefteå Hospital to declare the space occupied in protest against the impending closure of the maternity ward. The maternity ward occupation in Sollefteå, just like The Dorotea Insurrection, was far from a spontaneous starting point for organizing around the issue. In Dorotea there is what one might call a strong local tradition of resistance to centralization and rationalization, often with a presence of civil disobedience. The municipality was in the 1970’s the epicenter of wildcat strikes in the forest industry. In the mid-1970’s a municipal merger was also hampered by citizens occupying the municipal building and hunger striking. And in 2012 the local health center was occupied, after countless demonstrations and other attempts at advocacy, mobilizing the local and inland populations against the County Council’s austerity package, called»Project balance«. This is also the case in Sollefteå and its surroundings which is commonly known as »Ådalen«. As an example, the hospital had been threatened back and forth for way longer than a decade, in a geographical context were people have lived through half a century of state withdrawal. When austerity plans leaked in the autumn of 2015 – despite the ruling Social Democrats’ election promises to preserve all three emergency hospitals in the county – citizens were thus at least partially prepared. Among other forms of rallying, a broad discussion in social media had already begun, were local residents elaborated the consequences of future cuts. Historically Ådalen is deeply marked by the place it has in the Swedish labor movement’s narrative of 20th century success in the 1900s. In Lunde harbor, an hour by car from Sollefteå, five people were shot dead by the military in 1931 during a strike. The events are commonly viewed as the culmination for decades of conflict intensification with violent tendencies between capital and labor. Social democrats distanced from the participants in the Ådalen events, at the same time using the tragedy to push capital to bargain. So begins the process that is later known as the »Swedish model« – regulated negotiations between the unions and employers’ associations to create so-called collective agreements). Despite the half century past between those lethal military shooting in 1931 and the tangible threat to life of the various hospital cuts in the mid-2010s – mental connection is obviously potent. 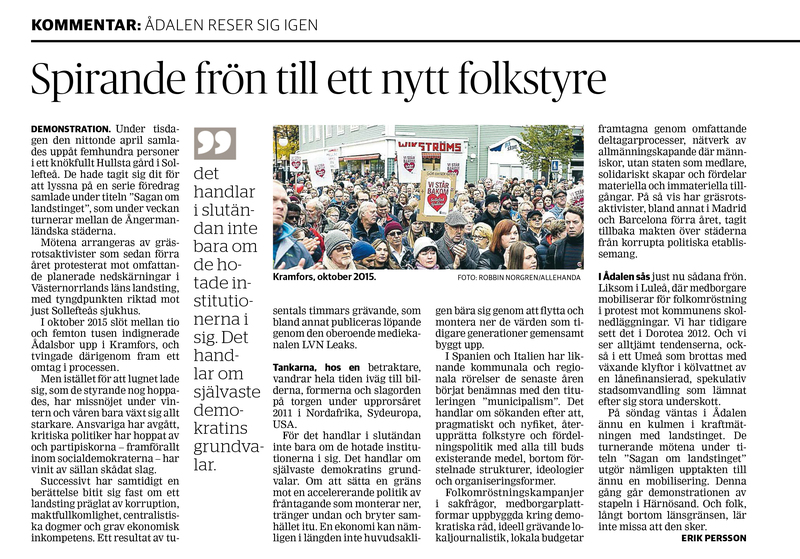 »Ådalen rises again« was the slogan for the first massive anti-austerity demonstrations on October 10th 2015. A year and a half later this movement has evolved into a complex network of experimental groups. Besides influencing public opinion and again and again mobilizing huge turnouts in the squares, there are also platforms for independent participatory investigative journalism. 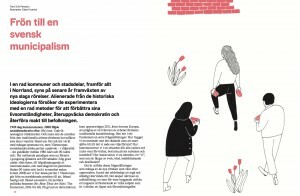 Other nodes are exploring alternative operational forms (like members-cooperations) for the provision of health care, and health care workers are organizing for different purposes, mainly outside the traditional unions and in collaboration with independent groups alike in other parts of Sweden. Now there is also then a maternity ward occupation on-going. 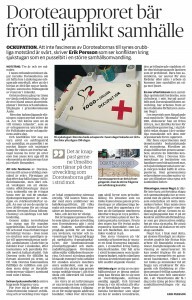 Meanwhile the struggle has spread to include the city Örnsköldsvik about an hour north from Sollefteå, as that hospital also faces threats of cuts within the same county council budget scheme. These movements are undoubtedly impressive, inspiring and touching, despite the sad circumstances they are faced to fight. In the footsteps of the Dorotea Insurrection, the Ådalen Uprising has offered fundamental insights for how dynamic social movements can recompose worn-out notions like democracy and equality to yet again have meaning. That cannot be taken away from the participants, no matter how the struggle for the hospital in general, and its maternity ward in particular, ends. This short essay was originally published 2017-02-02 in Swedish, by regional daily paper Västerbottens-Kuriren. As it was written for readers much familiar with the geographical and political context as well as the regional history, it might lack such explanations for other readers. Sollefteå municipality (approx. 20 000 inhabitants) is geographically located almost in the exact mid-point of Sweden though the 2/3 northern parts of Sweden is commonly perceived as the north of the country. 50 kilometers southeast is Kramfors municipality (also approx. 20 000 inhabitants). Örnsköldsvik (approx. 56 000 inhabitants) is located 74 kilometers northeast. The county council, or region as it is now re-named, is Västernorrland (approx. 245 000 inhabitants). The administrative center is the city Sundsvall (approx. 100 000 inhabitants) 86 kilometers south of Sollefteå. The name Ådalen does not refer to any kind of administrative division. It is the common description for the territory around the river Ångermanälven. Three years and three months. 1196 days during which citizens took turns to maintain attendance 24/7 at the squatted entrance hall of the health center. Occupation began early 2012 when locals had just enough of the county council’s successive dispossession of resources from the inlands. 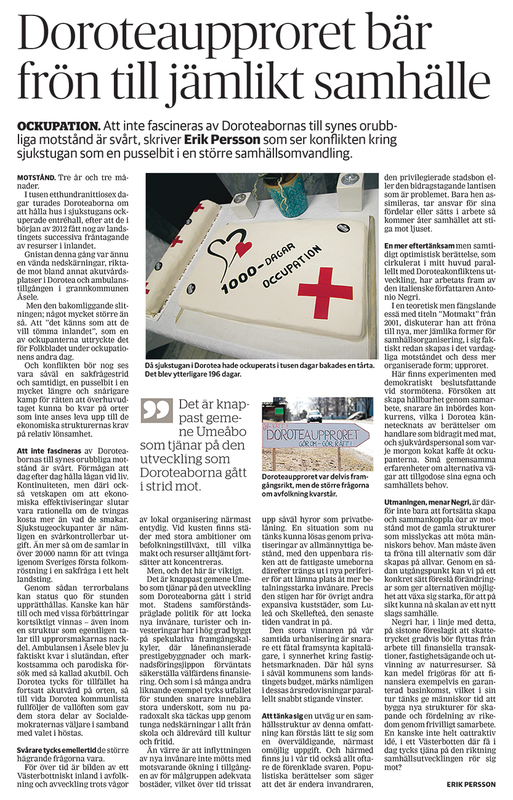 Sparked by another round of cuts – this time aimed to close the emergency room here in the village Dorotea and to take away the ambulance from next-door municipality Åsele. There are underlying tensions beyond the particularities. It’s about »them wanting to vacate the inlands«, as one squatter told a regional newspaper during the second day of occupation. This situation is perhaps better understood if perceived as both a specific conflict and as a piece of a grander puzzle of continuous struggle for the right to stay put in territories considered relatively unprofitable in today’s economical structures. It’s easy to be enchanted by the Dorotea villagers’ hard-core resistance. By their continuity of struggle and their affirmed idea that so-called »efficiency plans« are no longer effective if the cost is greater than the savings. Health center squatters are a hard-to-control expense – even more so when they decide to gather 20 000 signatures to force the first ever referendum of its kind in a Swedish county council. It seems that these actions has made it possible to at least sustain status quo. They may even have short-term potential to win certain improvements, although structural conditions really speak to the disadvantage of the insurrectionaries. Looking from the vantage point of today it appears that Åsele will still have its ambulance, after some expensive and parodical attempts to create compromise solutions in the form of what was called a »emergency car« – basically a station wagon with some reflex paint on it. And for the moment it looks like Dorotea will continue to have emergency health care as long as the municipal political party DKL prosecutes the promises that granted them huge amounts of previously Social democratic voters in the recent fall elections. But greater concerns are however still looming around. Regardless the cycles of local organizing, the depiction of the Västerbotten inlands as a territory plagued by depopulation and stagnation is yet intact. Concentration of power and resources remains its flow towards cities by the coastline. But, and this is important! It is hardly the ordinary citizen of coastal cities like Umeå who gains from the development that the Inland insurrectionaries oppose. Umeå’s consensus-marked political goals to attract new inhabitants, tourists and investors are heavily based on speculative success calculations centered on credit financed boasting constructions and marketing stunts in hope of securing the future financing of welfare expenses. Today the outcome, like in most other cases alike, rather seems to head towards increasing deficits that paradoxically is to be covered by vast cuts in everything from schools to eldercare to culture. Even worse is that the unceasing influx of more inhabitants is not countered by the same enumeration in access to adequate housing, which of course increases rents and mortgage costs. A situation which governing actors now hope to solve trough privatization of common good housing stocks, with the apparent risk that poorer residents are pushed out towards the peripheries by wealthier groups. Other coastal cities with population growth, like Luleå and Skellefteå, has already taken steps down this path during the last couple of years. The true winners in this contemporary urbanization scheme are rather a few farsighted capitalists concentrated around the real estate market. Parallel to growing municipal and regional deficits there are notable growth in the annual account reports from businesses in those sectors. It’s somewhat overwhelming to visualize an exit plan from these structures and from the sight of inland communities it might even seem impossible. Instead our days are jammed with easy solution propositions: populist narratives portraying either the immigrants, or the privileged urban dwellers, or other times the »welfare recipient hillbillies« as the reason to all problems. If »they« assimilate, takes responsibility for their advantages or are forced into workfare society will again prevail. Rise towards the light. During the insurrection in Dorotea some contrasting notions has been circulating in my head – thoughts from Italian theorist Antonio Negri. In a maybe unnecessary complex essay with the title »Counter power« (from the 2003 book »Guide – Cinque lezioni in impero e dintorni«) Negri discusses how seeds of new, more equal forms of societal organization continuously are being produced within everyday resistance and more so in its more organized form: uprisings. Experimentation with democratic decision making are often inherent. And likewise is the elaboration of collaboration in opposition to Capital’s tendencies towards internecine competition. One can see these traces in the stories from Dorotea where shopkeepers for three years has freely delivered food for the occupation, while health care staff spontaneously provide other kinds of assistance. These are many though small-scale experiences of alternative paths to cater common needs and wants.According to Negri, the challenge is hereby not only to keep expanding and interconnecting islands of resistance against the constituted powers that fails to provide our needs. We must also carefully watch the seeds for alternatives that are inherently planted and experiment in making resilience grow so those relations can reach a societal scale opening the possibility to throw off the leech that is Capital. Negri has in accordance with these thoughts recently, in particular concerning the political situation in Spain, supported ideas of moving taxation from work to financial transactions, property ownership and the extraction of national resources to finance a guaranteed basic income, which might allow citizens to strengthen structures for creation and distribution of wealth trough free collaborations. Quite an attractive idea for Västerbotten, were almost no one seems to really benefit from the direction we seem to be heading towards at the moment, right? 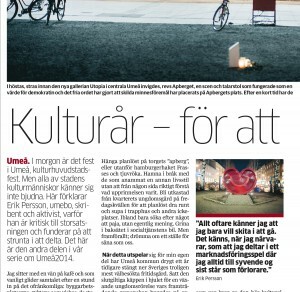 Originally published 2015-07-24 in Swedish by regional daily paper Västerbottens-Kuriren. The Dorotea Insurrection was a struggle between 2012-2015 against regional cuts focusing on saving the Emergency room in the village Dorotea (approx. 1500 inhabitants) and the ambulance service in next-door municipality Åsele (approx. 2800 inhabitants). Both villages are located in the inland parts of the Västerbotten county (approx. 270 000 inhabitants), which administrative center is the city Umeå (approx. 125 000 inhabitants) by the coast. The Dorotea Insurrection was notable for the inhabitants occupation of the local health center for more than 3 years, the campaign for a regional vote on these specific cuts and the ousting of the social democratic party from local power in advantage for a local party called Dorotea kommunlista – the Dorotea municipal list. The cuts where retracted in 2015. This essay was written as the insurrectionaries ended the occupation with the promise of developments in the inland health care.